Comics do not always have to be prodigious pieces of artwork with an amazing story to be any good. Cyanide and Happiness is one such example - stick figures make up all of the simply drawn panels of this webcomic and yet it manages to be one of the most read on the internet. Hosted by Explosm.net and originally created by a bored 16 year old named Kris Wilson, Cyanide and Happiness is now one of the most shared comics in social networking sites such as Facebook and Myspace. Cyanide and Happiness is for all those looking for a quick laugh. The jokes are what one would call anti-humor or black comedy, often dealing with controversial topics. But even when the comic portrays the most inappropriate jokes - the manner of the telling compels you to take it as a joke. The jokes are often different than what we traditionally see in comic strips - sometimes without any punch line and sometimes with adjacent panels of awkward silence. The sheer cynical nature of the characters and more often than not the anti-jokes are what makes this so popular. The strip has been known to have pop-culture and celebrity references such as those of The Beatles, George Bush and Obama. Some of the jokes are better revisions of classic jokes with a different punch line. The characters, as said before are all stick figures - the men being bald and the female characters distinguished by their longer hair. There are some recurring characters such as Obese Maurice, the Purple-Shirted Eye Stabber and Super Jerk. Sometimes the comic has a meta-fiction element to it where the characters know they are in a comic strip. 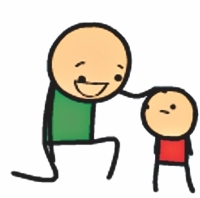 Explosm also has a YouTube channel, which features animated versions of the comics. With titles such as The Man Who could Sit Anywhere and Beer Run, the videos are as awesome as the comic strips. Due to the cynical nature of the jokes, one could think this would not be something fun to spend one's time on - but fair warning, clicking away on the 'next' button as you plough through the thousands of strips can get quite addictive. With content posted every day and their vast archive, which has content starting from 2005, this is a great way to pass the time and get a different view of the issues which worry the world. Let's not fool ourselves. It's nearly mid December and 2011 still has not shown us any movies that would actually make an impression on us. It was said to be the year of the sequels, they didn't say it was going to be the worst year in a decade, movie wise. 50/50 is a movie about a 20-something guy finding out that he has cancer, and battling the disease with all he's got. Sounds familiar? It probably does. It's a core ingredient for a lot of Hollywood sentimental dramas. Adam (Joseph Gordon-Levitt) is a 27-year old guy who works as a producer at a radio station; a typical nice guy leading a pretty normal life. 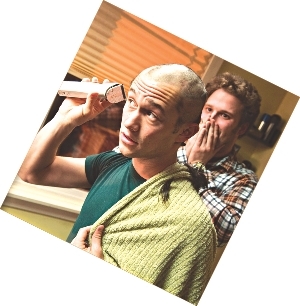 His girlfriend sort of takes advantage of his niceness, adding to his best friend Kyle's (Seth Rogen) annoyance. Adam complains about his back pains and breathlessness while jogging and a trip to the doctor reveals that he has a rare type of spine cancer that only leaves him a 50/50 chance of survival. Adam has to deal with cancer on his own mostly, with the help of his painfully inexperienced therapist (Anna Kendrick) and best friend Kyle. The storyline is quite simple and straightforward, not leaving too much for shock or guesswork. 50/50 stands out from the typical cancer movies in a few ways; the movie looks and feels quite real. The characters are relatable, music is decent and the movie is a humorous one, despite the subject. When Adam shaves off his head for chemotherapy, he looks at Kyle and says, 'I look like Voldemort' you can't help but smile. Adam's mom, played by Anjelica Huston stands out with a brilliant performance as an overshadowing mother who has a son with cancer and a husband with Alzheimer's Disease. Seth Rogen's performance is also surprisingly good. The movie is doing very well among the critics. It's already being considered as one of the movies to look out for in the next Oscars, but we are not telling you to watch it just because of that. 50/50 is a good-hearted movie with a lot of potential, with superb acting from the lead actors. It's worth a look. Most gamers in our country aren't familiar with Uncharted so I think an intro is necessary about the series. 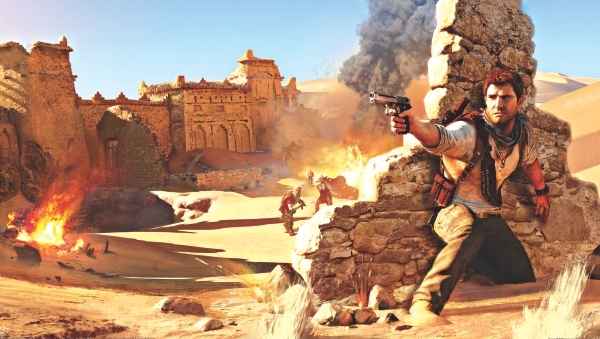 Uncharted is basically the male version of Tomb Raider which highlights the journeys of treasure hunter Nathan Drake and the games are considered a legend in the genre. Playing these games feel a lot like playing an Indiana Jones movie and the third game of the series came out this November. This time Nathan ventures to uncover the lost city of Uram also known as “The Atlantis of the Sands” and the journey leads him through England, France, Syria, Yemen and finally to the barren lands of the Rub'al Khali desert. As always, there is competition that has the upper hand in both quantity and quality but we all know who wins in the end. The gameplay is the same as before. A few new tricks like throwing back grenades has been introduced and some new weapons have been added as well (the PAK 71 and SAS-12 are personal favourites). The plot is good, as expected from the developers but the best aspect of UC 3 is its fluent graphics. The levels of the game were perfectly done, especially the ocean and the desert were handled smoothly, making them very realistic. Nolan North once again does a fantastic job voice acting Drake and the other voice actors are equally good. There are quite a number of puzzles in the game which are really fun to solve and if you fail (which might happen a few times) the answer will be given away as a hint. Although the game is stunning, it has some errors as well. It gives a lot of priority on hand-to-hand combat which is, frankly, unnecessary and at some points really annoying. The new villain Marlowe fails to prove herself as intimidating as Zoran Lazarovich (antagonist of UC 2). The chase scenes of the game were thrilling but once again irrelevant. Overall, Uncharted 3 is another brilliant masterpiece of Naughty Dog but unfortunately Sony owns it; meaning it's available for PS3 only. It may be a little inferior compared to its legendary predecessor but the odds are really high that it will be the game of the year in this year's Spike VGA. In 1962, sixteen year old John Lennon started a band with Paul McCartney. McCartney invited George Harrison to watch them and later on he and Ringo Starr both joined in to form The Beatles (moment of silence). Imagine a world where George Harrison was caught up doing something else and never made it to watch his friend play, or imagine if Lennon's mom hadn't allowed him to pursue his musical interests. Now, imagine a world with no decent rock music and only Pitbull. A cruel place. Suddenly zombie apocalypse doesn't sound so terrible, does it? Thankfully, God was kind, He let The Beatles form and he let us make films about zombie apocalypses. The world would definitely not be the same without either. Harrison picked up a guitar and Starr started on his drums and with the other two in perfect cohesion, The Beatles did the impossible. They created magic. They experimented and worked far outside the box, jumping across the board with each new album, boldly going where no musician had gone before. Particularly psychedelic rock. The Beatles weren't just a bunch of self-involved goofs. They were very in tune with the world and current politics, even after they broke up. John Lennon is famed for his participation to the peace movement. George Harrison was friends with Ravi Shankar and when he heard of our Liberation War and the struggles we were facing, he called up some of friends and they performed a concert in New York free of charge to raise funds for Bangladesh. Those friends included Eric Clapton, Bob Dylan, Billy Preston and Ringo Starr. Check out the song he wrote for us on YouTube; Bangladesh by George Harrison. We have so many artists and bands today popping out of nowhere with such talented musicians and there are just so many to love and to adore. Yet, teenagers and children today, who have been accused of being ignorant of history and the past, still listen to and appreciate The Beatles; music that is forty years old. Today is the death anniversary of John Lennon, which is the reason for eliciting such a tribute. Although we're pretty sure he's definitely rocking up there in heaven, we're still going to end with: rest in peace, old man.